Ah, Pralus, my dear. This name has been synonymous with fine chocolate for about as long as I have known of the existence of fine chocolate. I got their 100% cacao bar from Kakakwa Chocolate House back in 2008 and it was truly an eye-opening/chocolate-world-expanding experience. 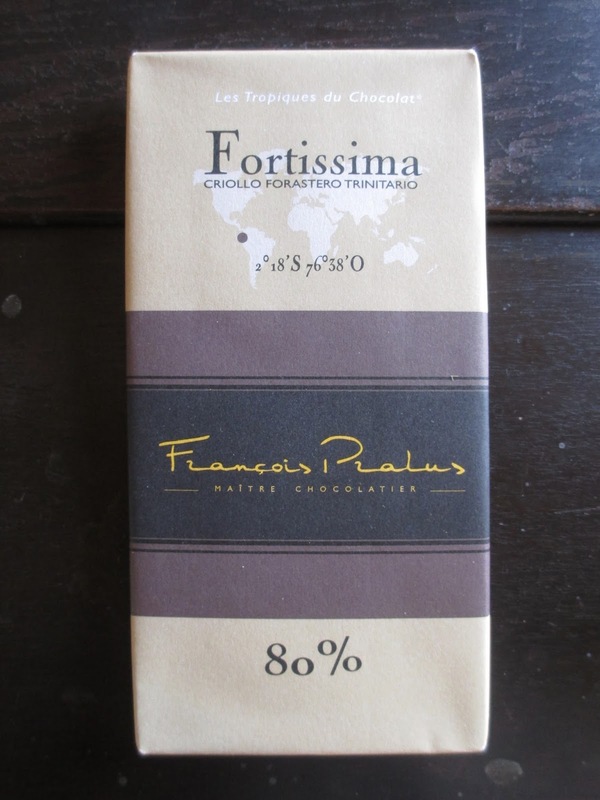 This bar, the 80% Fortissima, is also from Kakawa Chocolate House, and it's the last of my Santa Fe chocolates (next I have a series of chocolates someone brought me from Utah). When choosing which Francois Pralus chocolate bar I wanted, I simply looked for one that I don't think I had tried before. And the 80% cacao content of this Fortissima bar sounded just right. This chocolate is a blend of Criollo, Forastero, and Trinitario cocoa beans. Once again, there is no vanilla added to the chocolate because there is no need for it. Now, this bar was $12 (Kakawa's prices can run a little high, but it's worth it considering that they have such a good selection there), but it's a large 100 gram size--plenty to last a long time. Like seemingly all the chocolates I brought back from New Mexico, this one has a light layer of bloom on the surface. You can, however, still see that nice, simple design of the chocolate. It breaks into nice small squares that are just the right size for tasting. There is a deep cocoa aroma. Immediately on tasting, the chocolate feels smooth. It tastes deep, like earth on the ground in the middle of the woods. Then the flavor smoothens out, like the emergence of a pond of cool water. A taste of berries comes in from a wild berry bush. Not quite a fruity taste, I'm calling it a light berry taste, set on top of the richer, almost earthier, creamy base. The flavor simplifies as it finishes; it becomes a layer of creamy, chocolate mud in my forest metaphor. The aftertaste is thick and rich and light, nice and simple and straightforward. Given that I tried my first two Pralus chocolates in my early days of chocolate reviewing, it would be possible for them to not live up to the image of perfection I used to have. Yet such is not the case: this chocolate is very well done with such control of the process and the final product (no wonder Pralus is one of the few chocolatiers who can actually pull off, not just make, a 100% chocolate). This is what chocolate should be like. I find that I only need one small square of it at a time because that one piece is satisfying in such a complete way. This chocolate has no pretension, from the simple, light brown wrapper to the straightforward flavor. It simply tastes wonderful, and that is what is remarkable.